One of our clients recently asked us to identify the impact of the development of Free Standing Emergency Departments/ Hospitals on the market and on their hospitals specifically. State laws vary with respect to the rules and regulations regarding these new points of access. However, in states where they are allowed, the positive economics have fostered a building boom and are dramatically changing the patterns of utilization. Our study area included a population of just more than 4 million people. 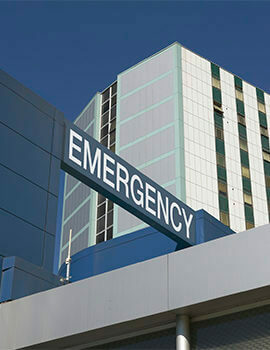 Over the last seven (7) years (2008-2015), the number of emergency departments has grown by 25%; growing from 32 to 44 sites of access; with nine (9) of the new facilities being free-standing emergency departments. During the same seven (7) year period, the number of retail clinics/urgent care sites has increased to number more than 200. This rapid expansion of access points has had a significant impact of emergency service access patterns and utilization. This increase is in addition to the utilization of convenience care options (e.g. : Minute Clinic, etc.). These clinics have supported more than 816,000 annual visits; equivalent to 181 visits per thousand residents. It is clear in the data that convenience clinic volume has come at the expense of the hospital’s emergency departments’ low acuity market share. 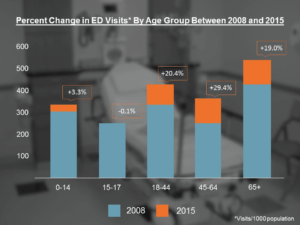 Over the same period, low acuity visit volume in free-standing/hospital based emergency decreased from 55% of all visits to 49% of all visits. The Affordable Care Act and other initiatives had hoped to foster a greater and more effective utilization of Primary Care; providing a more managed, cost effective means of managing health. While part of this pattern is due to a limited supply of primary care providers, it appears Americans are choosing convenience over continuity. This convenience has come at a cost to the patient. During this same period, charges for emergency services grew by 66% and 52% for level 5 and 4 acuity cases respectively; nearly three (3) times the rate of inflation during the same period. The expansion of access sites expands the utilization of emergent care services. Convenience Clinics also expand total emergent care volumes and move some of the low acuity volume out of the hospital. Without partnership/referral arrangements, the hospitals can see a loss in outpatient visits and directed admissions from free-standing centers. Hospitals could lose share in a high volume/high margin sector of their business. The change in mix to a higher percentage of high acuity patients means larger demands for ancillaries and slower throughput times (on average) in the emergency department. The Innova Group has worked with many clients and helped them better plan their service delivery network while addressing the expansion of free standing EDs and retail clinics. For questions about this article, contact Peter Trice, Partner at peter.trice@theinnovagroup.com or visit us at http://theinnovagroup.com to learn more our services and how we can answer your “what if” question.